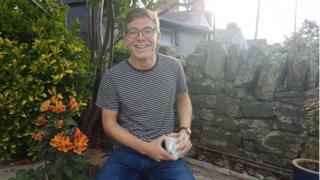 As figures show around half a million people with coeliac disease remain undiagnosed in the UK, one man, Sam Chettleburgh, 25, from Cardiff, explains how the condition forced him to quit his job. "I was diagnosed with coeliac disease in July 2017. To say I was stunned is an understatement, not least because I was working in the food industry, tasting products, and it meant I could no longer do my job. I have always had a strong love affair with food, a passion which led me to study a food and science technology degree at Cardiff Metropolitan University. What's the evidence for a gluten-free lifestyle? But my job meant I was constantly testing soups, pasta sauces, ready meals and cereal bars - the majority of which contained gluten. Initially following diagnosis, I tried spitting out the food I was testing, instead of swallowing it, but this wasn't sustainable. And four months later, I left my job and began looking for other roles within the food industry. At the time, this was very hard to accept. The diagnosis hadn't just changed my diet; it had altered my whole career. Gone were my dreams of developing products for the masses and travelling the world with my job. Looking back, though, I should have known something was wrong. Coeliac disease can hit at any time of life, and in reality, I had had symptoms since 2011, my first year at university. I used to get terrible ulcers in my mouth and throat, which at the time I attributed to being run down. I also felt lethargic and fatigued whenever I consumed gluten and, depending on how much I had eaten, suffered the typical gut problems, like diarrhoea. Eventually the mouth ulcers spread across my tongue and lips, leaving me in agony and needing to liquidise my food. I went to the doctor for blood tests, which together with a gut biopsy, confirmed coeliac disease. Perhaps I shouldn't have been surprised. My mother, after all, had been diagnosed in 2013, at the age of 50. She too had only began developing symptoms a few years previous, and felt very responsible for passing on the gene. Obviously, the diagnosis rapidly changed my career - I now work as a food information officer for Coeliac UK. But it also affected other aspects of my life. At home, I find it easy enough to cook gluten-free meals, but it can be difficult eating at friend's houses or going to restaurants. Drinking too is a problem. I love ale, and while the supermarkets are increasingly stocking gluten-free beers, they are still tricky to find in pubs. It is definitely more expensive to have a gluten-free diet, but I do get food such as gluten-free pasta, bread and pizza bases on a monthly prescription from the NHS. I feel lucky to live in Cardiff as there is a good choice of gluten-free products here, particularly in the larger supermarkets. The selection and quality of free-from brands is growing all the time, becoming more varied and exciting. There are also accredited restaurants where you know you will get a safe meal. But in rural areas of Wales and England, there is much less choice and it can be a real struggle to find food to eat. All in all, I have had to accept the diagnosis and deal with it as best I can. I do miss my old job, but the choice was made for me and I am now happy I can use my knowledge of food to help others with coeliac disease improve their everyday lives. " The charity Coeliac UK is marking its 50th anniversary at the Wales Gluten-Free Food Show at Cardiff City Stadium Wales.